About a year ago at a certain moment, I couldn't walk anymore without suffering a terrible nerve pain in my bottom and leg. I couldn't sit anymore, nor walk, nor lying. So big alarm in my mind; bought as soon as possible a MRI scan which gave a horrendous result: lumbal stenosis. Endured a lot of pain. Walked 3 months inside and outside the house with a rollator, stooped like an old man (which I am). Neurosurgon suggested that I looked too fit for sugery and maybe my body would cure itself. Which is by the way very rare for lumbal stenosis. hey boy, what did you do over there, alone far out at sea?.. "huh....., that's the only place where I'm happy, sir. Hate to hear it Ronald, always love to hear about your sailing. Back pain is awful, I've had severe flare ups of sciatica that leave me near imobile. Mines not continuous though and exercise seems to help even though it hurts at the time. Seems that wings would help, I worry about you ending up in the water with that kind of pain it would be very difficult to get back on the boat. Though I still remain a junkie with regard to NorthSea sailing, I have lost in time my recklessnes with becoming older. 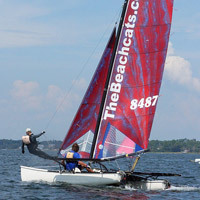 Because its a small cat with a solo sailor ; it doesn't look so big also. But the problem making something like that which can also be folded during the roadtrip remains. Besides I'm afraid that it catches to much waves on my spot. See my vids on YouTube (search for ronald reeder). Especially the last vid taken in 2017, with wind and waves on the beam, shows my problem. Ofcourse any helping remark is more then welcome. 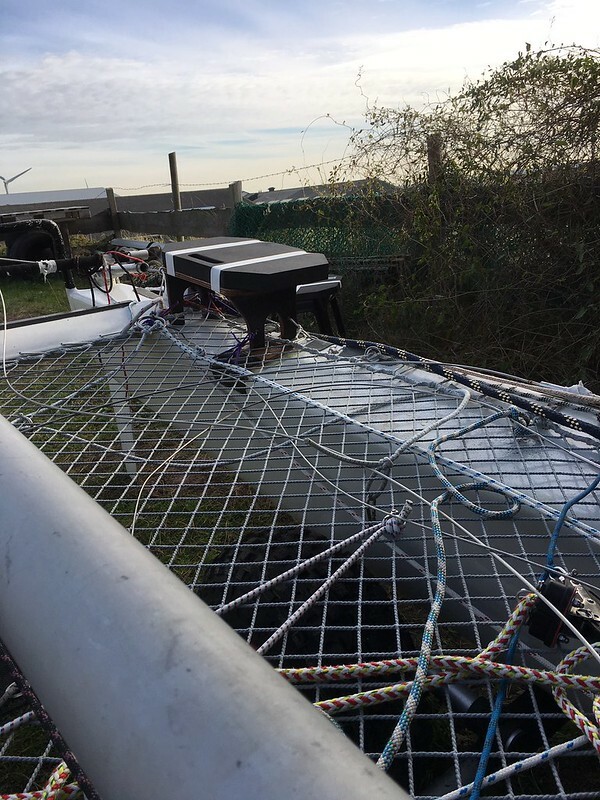 I have to swallow a bit my pride comparing this vid with the above pic of my improvised stool on the left hull. 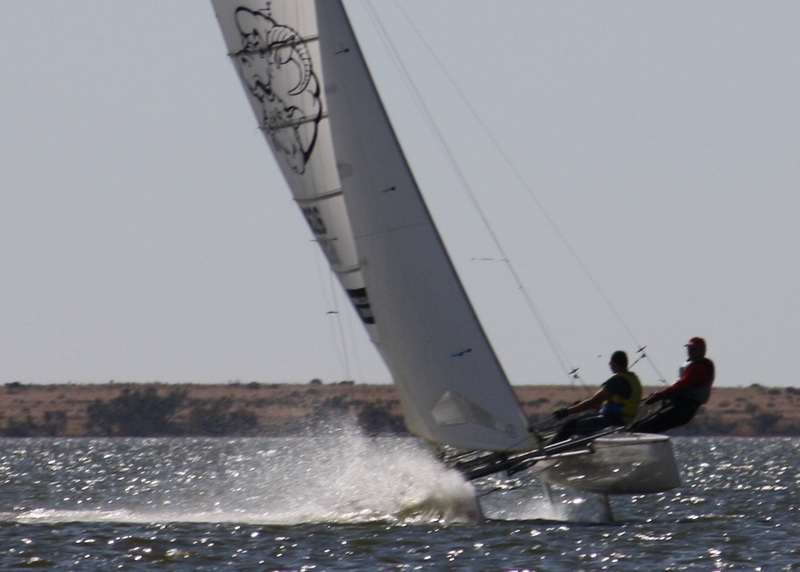 I sailed/raced a Hobie 18 with wings for 20+ years in all conditions and found the concerns about wings hitting waves to be overstated. 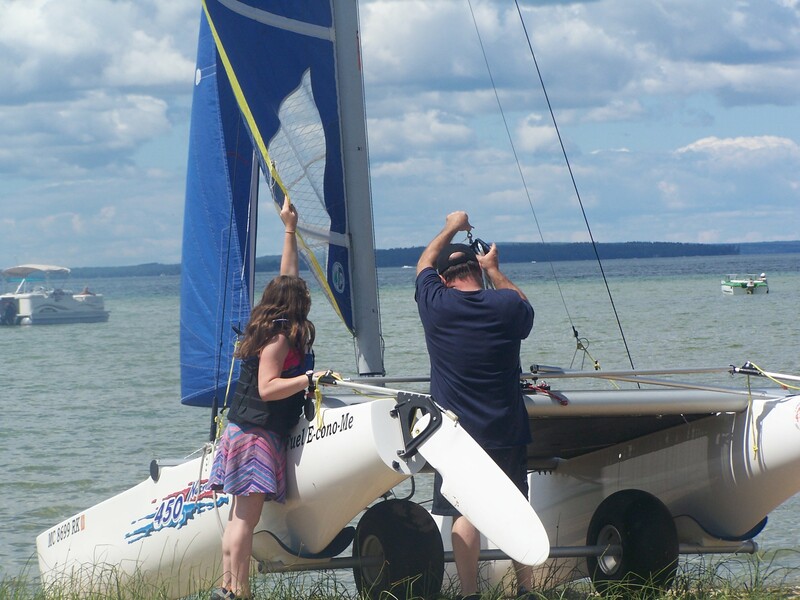 There aren't that many designs with factory wings to choose from that are also light enough for the solo sailor, obviously there is the Hobie 17, which is designed to be solo but it has pretty heavy mast and I've never liked the way the wings socket into the hulls. The Hobie FX-One is light and more modern but probably hard to find. 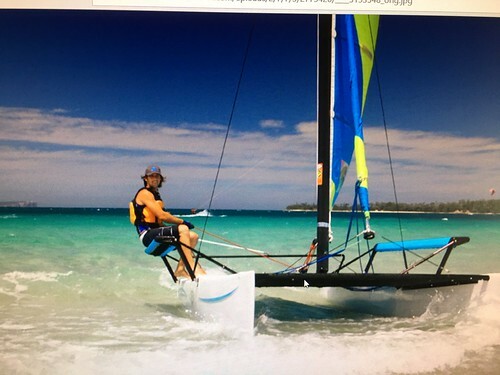 People have modified the Hobie SX18 wings to fit on many other boats, those wings connect to the beams and hinge up for trailering. They are pretty big and heavy though since they are quite long and designed for two-up. 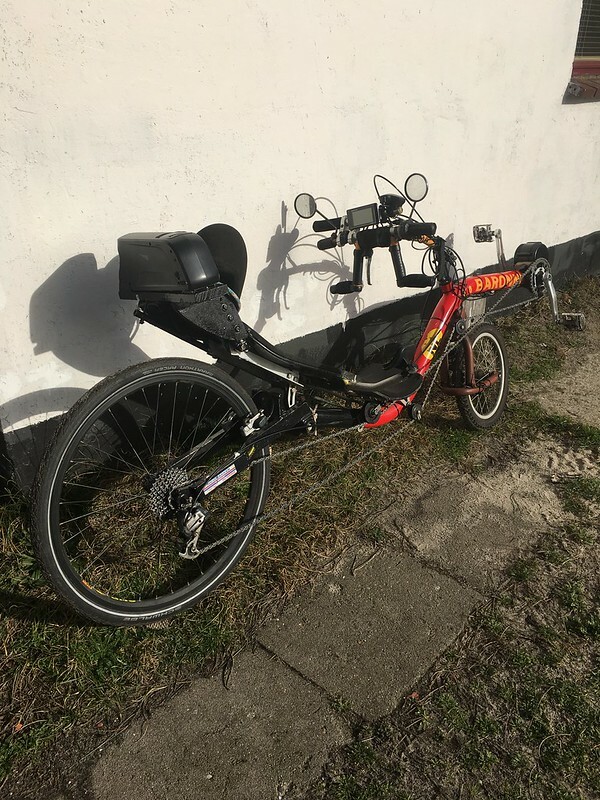 The wings/benches for the Hobie Getaway can also be used on other designs, I know someone who installed a pair on a Prindle 18 and it worked very well. Last edited by Mike Fahle; 11/12/18 08:30 PM. Thanks Mike for your interest and advice. I had never heard of these Lysate injections but I will certainly look into it. In my case there are several bulging discs ( which is hernia) but the main problem stays the stenosis which is in fact calcination of the nerve channel in the spine. But I can ask my neuro surgon about this treatment. By the way my experiment with the improvised stool has failed. I have tried it on a very bumpy sea. 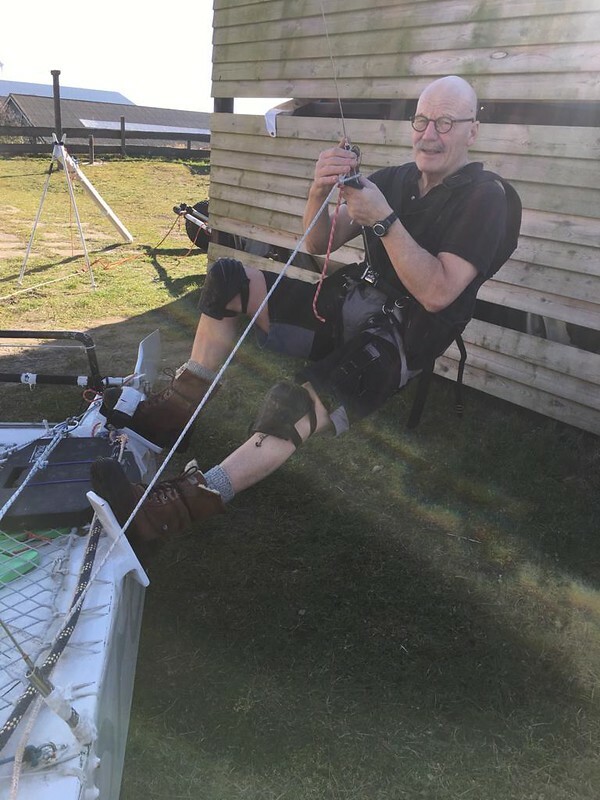 It appeared that the force-equilibrum which I 'm used to make with my stance hanging on the wire is impossible to do sitting 30 cm above the hull. In fact I have forced my back trying to do so with a very painfull period after that. So wrong idea. Hi Ronald, Look for a doctor specializing in sports physiology - especially doctors who work with athletes. I suspect that surgeons would not be familiar with it nor in favor of it as it is an alternative (better usually) to the cutting they are trained to do. I have learned that platelets do more than just clot blood; they have different proteins inside that initiate, promote, and accelerate healing (makes sense when you think about it). They even "flag down" passing stem cells in the blood and get them involved - hope that is not too technical ;-). My doctor told me to think of it as rebooting the healing process and that they still have a lot to learn about it. 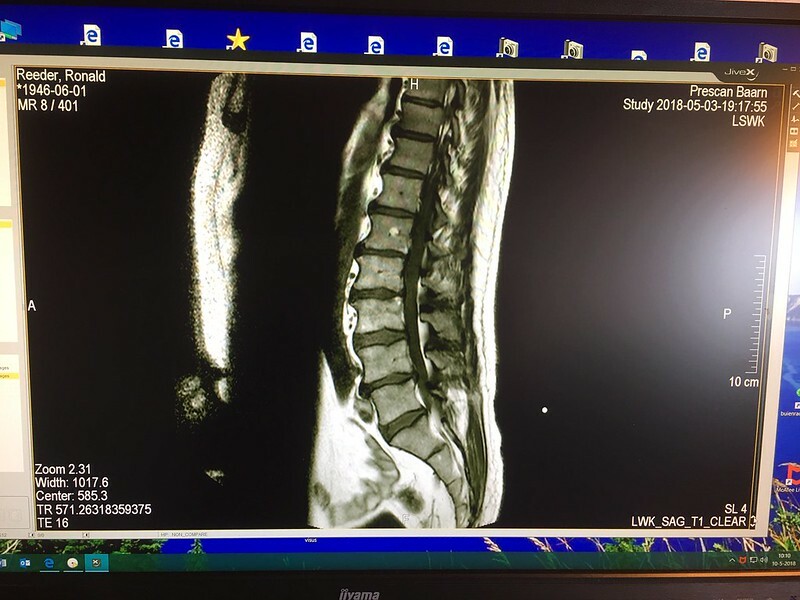 I try to keep this basic but the proof is in the before and after imagery of my spine as you showed yours. I am a natural skeptic but the images clearly show the discs have regenerated and the bulges are gone, along with the pain. I tried this for my spine after I had already had two longtime-torn tendons in my rotator cuff repaired using PRP (Platelet Rich Plasma) - the main difference between the two procedures is that they freeze the platelets and remove the cell walls before injecting what is left into the back right next to the damaged area - they would be too viscous (thick) otherwise whereas in the shoulder the viscosity is not an issue. So they are taking the platelets from your own blood and then injecting them precisely where needed to heal yourself. It is truly a modern medical science wonder and thankfully we have lived long enough to benefit from it as they continue to develop the science. What if you build a wing similar to a Hobie 18, but build an angled back to it. I think it would give more security in the bumpy conditions. P 18-2 Mod Turbo "FrankenKitty"
Thanks Texas for your idea. I agree that it will give me some extra security in a bumpy sea. But I'm afraid not enough. Wow... that looks cold... :-) What about having some sort of forward/aft preventer on you? basically, have a line forward with a small block and tackle and one aft with a block and tackle. have them to a central snap shackle with a quick release - just incase. The thought is you can get settled on the wing, and then clip into the preventers, then tension the forward and the aft to keep you from lurching forward or backwards. On another note, I'm surprised on the clip you use for your mainsheet. I would think it does not have sufficient strength. I have had those blow up on different applications. Finally watched this video, really great, put it up on the 70 inch and was glad to note that you left the authentic sound of the boat and water instead of blasting music over it all. Do you mean my clipping the trapezeharness to a leash line for safety reasons? This leash line (in fact a kite leash) goes to a supportbeam behind the tiller-cross tube. And there it can run freely from hull-stern to hull-stern. In that way I will not hangup myself when capsizing and falling down backwards. In fact I can move around the whole tramp while being hooked to this leash. By te way, I have ofcourse this standard kite unleash mechanisme which can be used in the situation where this will be necessary. Okay Tuma now I finally see on the vid what you ment by the clip to the mainsheet. my L4 was completely pinched, I had severe pain shooting down my right leg, could'nt walk, sail, work. This took a couple years to get here but no surgery. Thanks Carl for sharing your experience with us with regard to back problems. I must say that I had done some spine manipulation and traction therapy in the past; but it didn't cure me. On the contrary it made everyting worse. So bad luck and I will never ever try that again . Forward flextion exercise which you mentioned, seems logical, combined with back strengthening. But you are 60 and I 'm 72. Those twelve years make all the difference!